The toy retail business is a very different world. Finding out about it, we have discovered a whole new way of looking at toys, children moms and families. merchandising is a key word and shopping is the new game. 1 month of effective work, 50 product shots, some backgrounds & wallpapaers and a CMS were enough to bring some magic to Magic Factory. The toy retail business is a very different world. Finding out about it, we have discovered a whole new way of looking at toys, children moms and families. merchandising is a key word and shopping is the new game. Toys are not just for kids anymore. 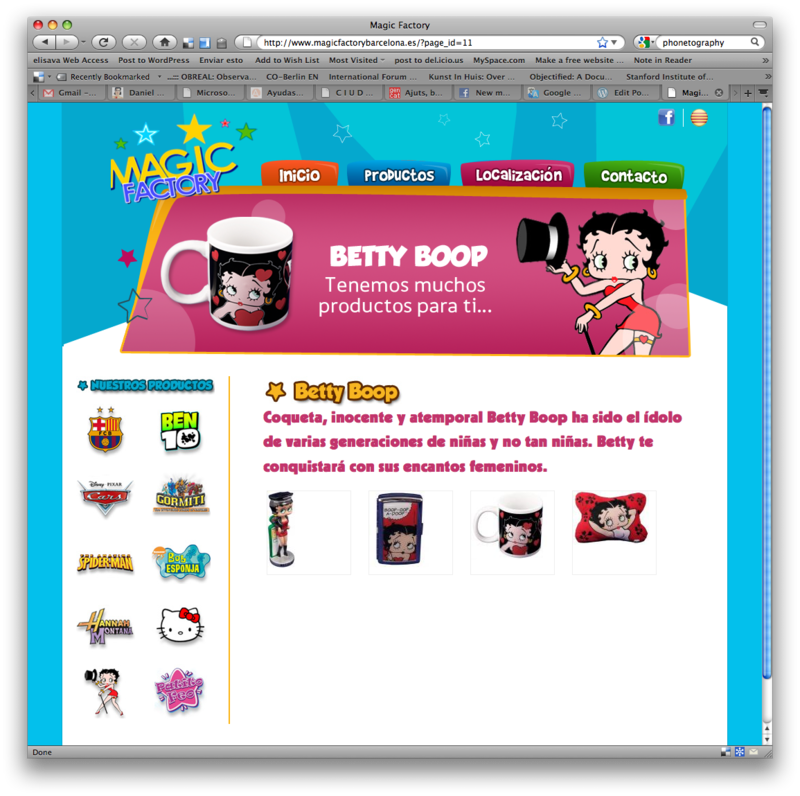 Magic Factory is a franchised network of stores in Spain, that sell merchandising items made mostly in China and distributed across the peninsula. It focuses on objects, toys and personal items licensed under major brands like Disney, Warner, King Features Syndicate (Betty Boop), Sanrio, Cartoon Network, Nickelodeon & Viacom, Marvel, and local brands like FCB Barcelona. These shops sell and promote brands featuring music, films, sports and cartoon characters. Among all these brands Magic Factory has develop a classification based on sales and permanence. Products related to Betty Boop, Hello Kitty and classical Disney characters like Mickey or the Princesses are considered permanent and basic, somehow essential. Big impact characters like Sponge Bob, Spiderman or Cars, are strong and versatile and attract younger generations. 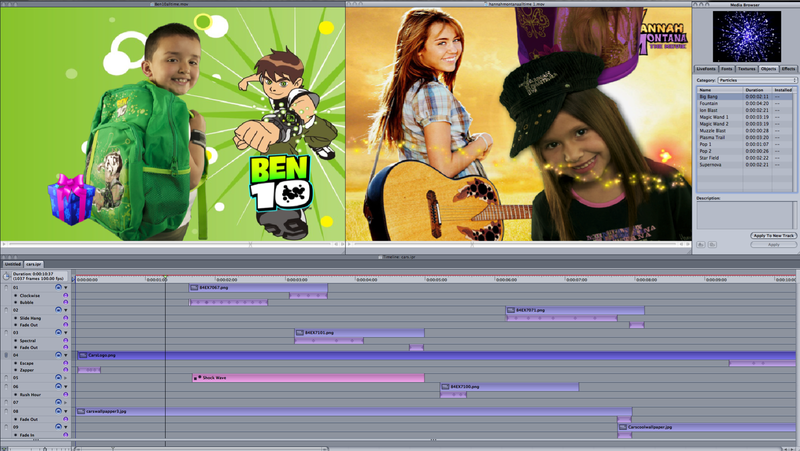 Third category would be short term brands like Hannah Montana, Jonas Brothers, Ben 10, Gormiti or Patito Feo (Disney LatAm) that come and go very fast and boost sales for one or two season. Babyboomers & Young Couples: are also a strong presence in the stores, but as far as we could notice they are looking for ¨safe & standard¨ toys and contents for their actual or future children. this search is evident in the amount of questions they ask prior to buying anything. New babies or small children from young couples seem to be the basic parenthood learning course though commodities. Housewives & Grandparents: a very different approach was noticed when we asked about experienced parents, they know what their children like, how they would react, how to make it look like a reward or as a tool for negotiating with their children. In this case toys become a powerful tool to trade better grades, commitments and changes in behavior. Grandparents also earn points providing those toys parents would deny or cannot afford. Power roles and hard negotiation is also present here. Teenagers are the oldest population in these stores, usually attending in groups and trying to find a symbol of status, identity affirmation or acceptance trough merchandising and commodities. For them the object is not relevant, but the power it gives to their public image. Thinking about all these facts we created three pieces of communication: 1. shop window videos that include animated images featuring real kids with the main characters and store products, an updatable website where products can be seen as in a catalog linked to a facebook website 3. where all audiences can interact and get news and feedback from their local shop. 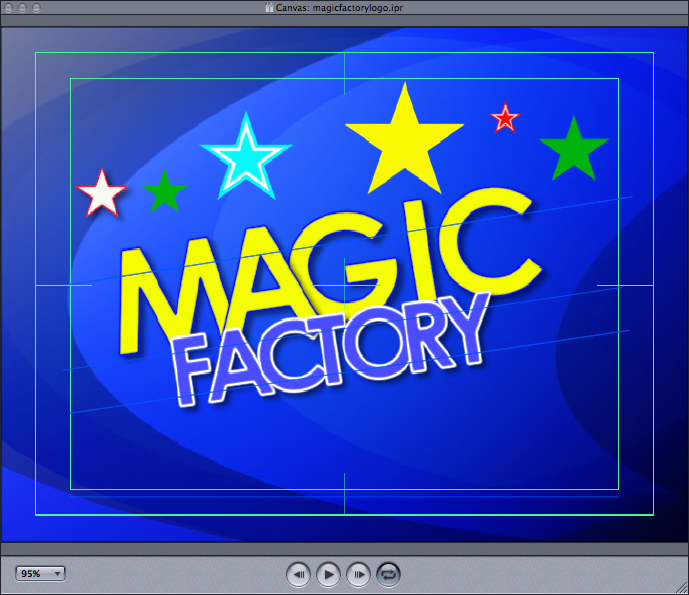 1 month of total work, 50 product shots, some backgrounds & wallpapers and a CMS were enough to bring some magic to magic factory. Last week a very big event gathering more than 300 sales executives from around the planet took place at in Barcelona. Open Text´s the Art of Good Business is the annual get together for the sales force of this Canadian Multinational that sells software and digital solutions, content management protocols and consulting to goverments, other multinationals and international organizations. 3 days of lectures, coffee breaks, conferences, live music, stand up comedy, parties and team building activities were registered, organized and edited by the audiovisual team of Algo Bueno. Guests from Germany, UK, France, Canada, Italy, Netherlands and the USA enjoyed the many attractions of the and had a lot of fun while competing for the best performance in selling millions of dollars in services globally. The event was organized in Barcelona by Lifestyle Experience Group in coordination with Opium Mar, Ab Skipper Hotel, Arts Hotel, Llotja de Mar and Algo Bueno among other companies.